As a nation we are getting used to recycling at home, our local authorities are helping by providing recycling centres. Many local authorities now have specific recycle bins for households, this has cut down the amount of waste that needs to go to landfill. What we need to do is carry our habits from home into the workplace too. If we can reduce the amount of waste produced at home by recycling then we can achieve greater results by doing this in the office as well. It can help reduce your office carbon impact and reduce business costs. Getting into the habit of recycling at work can be difficult, especially when there is a group of people involved. 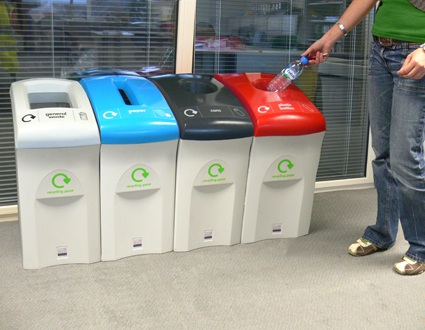 Recycling has to be instilled into everyday office life for colleagues and co-workers. As a business owner or office manager there are a few things that you can do to encourage recycling. Break the office into parts and provide recycling points with clearly labelled bins for each. So there you have it, there are lots of things that can be recycled in and around the office. Just make sure you have bins prominently positioned and clearly labelled. You will find this really helps people make an effort and recycle rather than waste.